I live in Seattle now! Officially. There were two flights, a road trip through Portland (with doughnuts) and a few choice words to a less-than-stellar moving company along the way, but I’m writing now from my new home office (strewn with boxes and receipts and packing tape, but still) in Seattle. Because I live here. In other big news, it’s raining. Amidst the chaos of unpacked boxes, echo-y half-furnitured rooms, new streets to navigate and what feels like constant drizzle, I’ve been stress eating since I got here. Did I mention that BOX of doughnuts? Yeah. There’s been lots of pizza. And there was ice cream, too. Twice. Alone. Yesterday I decided to take charge. I went to my happy place (Whole Foods). I stocked up on leafy greens and fruit and peanut butter. I color-coded my cookbooks. Then I made this salad, and it felt so good to get some actual health back in my routine. Roasted greens are the way to go. They wilt from the heat but keep their toothsome heft, their deep flavor intensifying and their edges crisping delicately. Tossed with some fresh herbs, a bit of quinoa, and plenty of soft avocado, tart grapefruit and a handful of meaty pistachios, and you’ve got yourself a lunch you can be proud of. The boxes will get unpacked, and the furniture will fill in eventually. And the rain, well, it has to stop at some point, doesn’t it? Heat oven to 400 degrees F. Slice or rip the chard and kale into bit sized pieces (leaving the tough parts of the stem behind), and toss them on a baking sheet with olive oil to coat, salt, pepper and crushed red pepper flakes. Roast the greens for about 1/2 hour, until wilted and crisp at the edges. 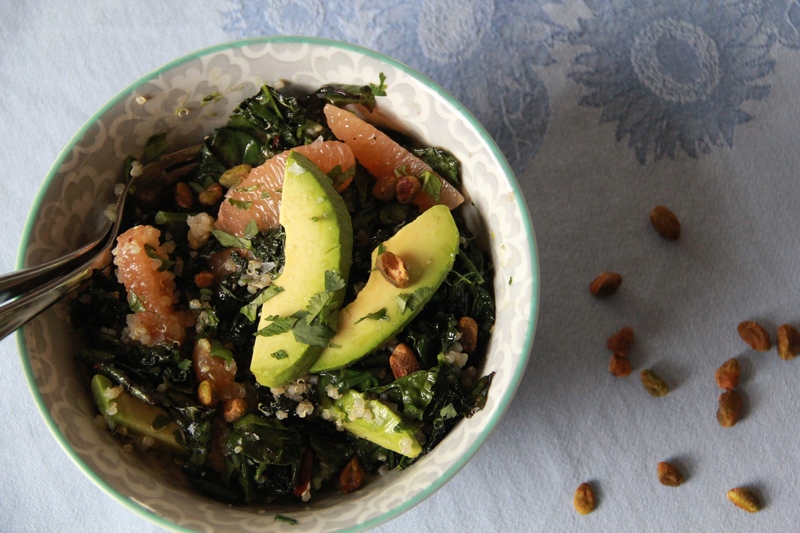 Allow the greens to cool slightly before tossing in a medium bowl with the quinoa, cilantro, mint, avocado, grapefruit (squeeze the supremed grapefruit membrane over the salad, too, to release some juice) and pistachios. Drizzle with a bit of extra olive oil and finish with a big pinch of flaky salt. Serves 1 very hungry person or, more likely, 2 regularly hungry people. Previous Post: « Pi Day! OY to the snow. Enough already!! Welcome to your new abode. Love this salad. And it’s raining in Philadelphia for the next few days. We’re just happy it’s not snowing…. so happy that youre back!! i think itd be super cool if you did something with molly wizenberg, especially since both of you are in seattle now. Best of luck in Seattle Molly. Your cooking will continue to make us jealous to look at! I have extra chopped cilantro. This is perfect. Today is so gray and icky in Seattle and your salad looks so bright and cheerful. Thanks!